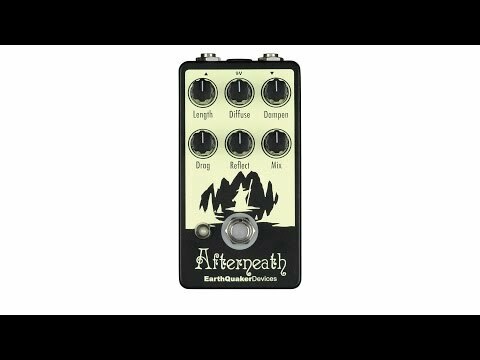 Product Overview The Afterneath sounds a lot like it looks – a wizard in a cave in a box. You are the wizard – or sorceress, if you prefer – and the cave is your instrument’s signal, vast, expansive, and magical. Do you go inside? Roll a D20 to proceed! • Length: Controls the decay length of the reverb. • Diffuse: Adjusts the spread of the reverb. Sharper with more attack counter clockwise, more ambient and washy as you turn it clockwise. • Dampen: Clockwise for brighter tones, counter clockwise for darker tones. • Drag: This digital reverb is made up of a bunch of short delays, this separates the delay lines creating a stuttering, pingy effect. This is the coolest control on the Afterneath; we highly advise slowly turning this while you let notes ring out for a cool warped speed effect. More delay as you turn it counter clockwise, more reverb as you turn it clockwise. • Reflect: Controls the regeneration of the reverb, turn clockwise for more wash and echos, counterclockwise for less. This will self oscillate if turned up high. • Mix: Blends the wet signal into the dry. Though it does not actually go full wet, it will gradually lower the clean level as you turn it clockwise and give the appearance of full wet. • Switching: This device is true bypass and uses electronic relay-based switching. Audio will not pass without power. • Power: For best results, please use the included 9v center-negative 1-amp DC power supply.